To provide maximum clarity, the following definitions will be used in the context of defining State of Ohio NPS Plan targets and priorities. It is recognized that these terms may be used and/or defined differently outside this context. is surface or ground water that has become contaminated as a result of passage through a physical environment created by coal mining activities of the past. This contamination can occur in the underground voids created by deep or underground mining or it can occur by water passing through coal mining refuse left on the surface. 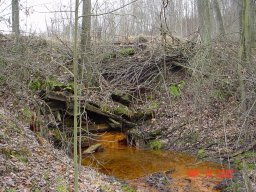 a systematic watershed-based assessment of acid mine drainage (AMD) impacted streams; AMDATs summarize the AMD pollutant loads, suggest treatment alternatives and preliminary costs for remediation, and recommend future monitoring activities. used here in the context of sustainable organizational capacity; the actions necessary to achieve the various outputs; who does what, when, where, in what ways. Provide project assessments and associated support/suggestions to the local watershed coordinator. is the level at which water just begins to flow from the stream onto the floodplain and is associated with the discharge most effective at moving sediment. Bankfull stage results in the average form or morphology of the stream. describe existing or potential uses of waterbodies including public water supplies, protection and propagation of aquatic life, recreation in and on the water, agricultural, industrial and other purposes. There may be more than one beneficial use designation (PDF 87kb) assigned to a waterbody. see management practices; the term BMPs will not be used in the NPS Management Plan, since "best" can be a highly subjective and site-specific label. For example, within a state or region, a practice may be considered best in one area, but inappropriate in another area. The least common type of Ohio reservoir, they are among Ohio's earliest impounded waters and were developed to provide water sources for the Erie Canal system. There are six canal lakes in Ohio: Buckeye Lake, Indian Lake, Lake Loramie, Grand Lake St. Mary's, Guilford Lake, and Portage Lakes. Canal lakes are generally shallow, fertile, and large (340-5,138 hectares [851-12,844 acres]). is the people who live in, work in or have an interest in a watershed. a watershed action plan meets the criteria of Ohio's Guide to Developing Local Watershed Action Plans in Ohio including the Appendix 8 Update and the most recent U.S. EPA Section 319 Planning Guidance, but only with respect to some, but not all, of the particular causes or threats to impairment in a watershed; or a plan that meets some, but not all, of the criteria referenced, and this conclusion has been stated in writing by the chiefs of the Ohio EPA Division of Surface Water and the ODNR Division of Soil & Water. Conditions associated with the endorsement letter describe steps and time lines to meet the criteria for full endorsement. are the sub-set of locations within the watershed or aquifer, where the magnitude of NPS pollution and/or habitat/hydromodification, results in water quality impairments or threats to full attainment. Because impaired surface water areas are not in compliance with Clean Water Act requirements and drinking water sources with MCL exceedances are in violation of the Safe Drinking Water Act, they are priorities for action regardless of whether current resources, level of public interest, or data is fully available to correct the situation. a numerical rating and weighting system that is combined with the seven DRASTIC factors listed below to calculate a ground water pollution potential index or relative measure of vulnerability to contamination. The DRASTIC factors are weighted from 1 to 5 according to their relative importance to each other with regard to contamination potential. 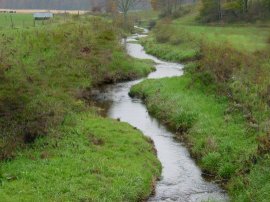 is the state of balance between stream inputs and outputs, primarily sediment and water supply and discharge. used here in the context of examining and documenting whether the core components of successful watershed action planning and implementation are in place. Core components are science-based, community-led, and sustainable. a term used by Ohio EPA when assessing the status of water quality. Exposure indicators are those which quantitatively measure the effects of certain stressors and can include whole effluent toxicity tests, tissue residues, and biomarkers, each of which provides evidence of biological exposure to a stressor or bioaccumulative agent. Other examples of exposure indicators are pollutant concentrations, alterations of habitat or flow, and pollutant assimilation and uptake. the elevation and extent of land adjacent to a stream channel that is periodically saturated or inundated with excess flow from the stream during storm events or after ice/snow melt. a qualitative statement generally outlining what is to be achieved without defining how it will be measured or when it will occur. For example, an environmental goal would be to reduce water quality degradation due to urban run-off. For example, a planning goal would be to improve stakeholder participation in watershed action planning. Specific locations where physical, chemical, and biological factors provide life support conditions for a given species (IJC 1989). is a subset of habitat modification because it is often the RESULT of habitat modification. Hydromodification occurs when man-made structural changes to the landscape alter the amount or physical character of the water in the stream (e.g. - increased overland flow and higher storm flows as a result of development, tile drainage, dams). a zone on the Gulf of Mexico's Texas-Louisiana Shelf with seasonally low oxygen levels (less than 2 mg/l). surface water bodies that do not meet beneficial use designations, narrative "free froms", numeric criteria and antidegradation provisions as outlined in Ohio's ambient water quality standards. the specific type, cost per unit, and quantity of actions (studies, assessments, monitoring, BMPs, restoration, preservation, or preventative measures) that must be implemented to achieve what is outlined in the solution statements. donated labor, money, land, machinery, equipment, food, etc. used here in the context of sustainable organizational capacity; which resources are allocated in what amounts at what times. any species, including its seeds, eggs, spores, or other biological material capable of propagating that species, that is not native to that ecosystem; and whose introduction does or is likely to cause economic or environmental harm to human health (2/3/99 Executive Order 13112). one of 23 rivers with watershed sizes of greater than 500 square miles. Collectively the Ohio LRAUs represent 1285 miles of river mainstem. small, but visible with the naked eye, animals without backbones (insects, worms, larvae, etc.). Water bodies have communities of aquatic macroinvertebrates. 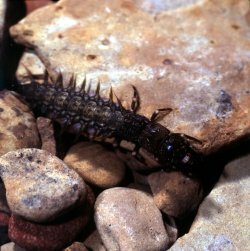 The species composition, species diversity and abundance of the macroinvertebrates in a given water body can provide valuable information on the relative health and water quality of a waterway. are defined as "economically achievable measures for the control of the addition of pollutants from existing and new categories and classes of nonpoint sources of pollution, which reflect the greatest degree of pollutant reduction achievable through the application of the best available nonpoint source control practices, technologies, processes, siting criteria, operating methods, or other alternatives." Management measures are generally groups of management practices that are used together in a system to achieve comprehensive goals. Management measures contain performance expectations and, in many cases, specific actions that are to be taken to prevent or minimize nonpoint source pollution. Individual management practices or specific actions needed to achieve these performance expectations are not included in the management measure statement. reduce or prevent quantities of pollutants that are generated at and/or delivered from a nonpoint source to a receiving water body. 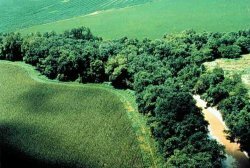 Preserve, improve, or restore self-sustaining stream channel and associated floodplain function is often used in lieu of BMPs. Individual management practices generally do not stand alone in solving water quality problems, but are used in combinations to build management practice systems. Each practice must be selected, designed, implemented, and maintained in accordance with site-specific considerations to ensure that the practices function together to achieve the overall management goals reliably and efficiently. Management practice systems are generally more effective in controlling the pollutant, impacting the habitat quality and/or stream channel stability since they can be used at two or more points in the pollutant delivery process or to address two or more limiting factors to stream integrity. are federally derived health limits for treated drinking water based on the Safe Drinking Water Act. Specifically, the MCL is the highest level of a contaminant that is allowed in treated drinking water, MCLs are enforceable standards, and many MCLs (e.g. atrazine, simazine) are based on annual running average concentrations. pollution that is the result of land use activity or disturbance of the stream or aquifer system. Sources can be classified into two categories: polluted run off and physical alterations. Polluted run off is rain and snowmelt flowing across the land surface or within ground water that picks up contaminants and carries them to the stream or into the aquifer. Physical alterations are changes to the stream channel or its corridor, including straightening, deepening, widening or changes in flow patterns. Numeric criteria are estimations of concentrations of chemicals and degree of aquatic life toxicity allowable in a waterbody without adversely impacting its beneficial uses. Although numeric criteria are applied to waterbodies, they primarily are used to regulate dischargers through NPDES permits. used here in the context of sustainable organizational capacity; products that are controlled by the organization and stem directly and measurably from the inputs and activities. waters that have special significance for the state because of their exceptional ecological values and that have been so categorized pursuant to paragraph (E) of OAC 3745-1-05. To qualify on the basis of exceptional ecological values they must meet the qualifications for superior high quality waters and be further distinguished as being demonstratively among the best waters of the state from an ecological perspective. Natural Indicators - direct measures of target status. For example, if the implementation target is a QHEI score of 60, then QHEI score results over time are a natural indicator. Ohio EPA also uses the term "response indicator" for natural indicators. Another example of a natural indicator is, if the planning target is to find the lowest cost option, then dollars is a natural indicator. Constructed Indicators - indicators constructed for or tailored to a target. For example, if a target is a 30% reduction in nitrogen loadings to the stream, then a decrease in phosphorus pounds per year based on loading reduction estimates using ODNR spreadsheet or USLE is a constructed indicator. For example, if the planning target is to evaluate community appearance, a constructed indicator may be survey-based ratings of unsightliness. Proxy Indicators - indirect measures of a target; for example, if a target is to improve water quality by repairing failing HSTS, a proxy indicator may be the gallons per day adequately treated. If a planning target is to improve highway safety by 80% by 2013, a proxy indicator may be the annual number of highway fatalities. characterize the "as is" surface or ground water quality impairment or surface or ground water quality threat and the reasons for it. is a more general statement regarding the reason for the existence of something (e.g., Agency mission statements). Often answers the question of "why" something is being done, without being quantitative or clearly identifying how achievement of the purpose will be measured. is composed of an array of metrics (PDF 36kb), that evaluate stream substrate and gradient, instream cover, and stream channel, pool/riffle and riparian quality. These physical habitat attributes (see Table 2 on page 6) are important in explaining the species presence, absence, and composition of fish communities and other aquatic life (e.g. invertebrates) in a stream. The QHEI is a macro-scale approach that measures emergent properties of habitat (sinuosity, pool/riffle development) rather than individual factors that shape these characteristics (current velocity, depth, substrate size). process to recreate the functions and processes of a naturally stable ecosystem with the understanding that it will be quite different from the condition prior to disturbance (e.g., Successive Alkalinity Producing Systems (SAPS) for AMD reduction or elimination; setback ordinances; 2 stage channels, bank stabilization, fish passage structure on dams). process of working to recover natural functions, ecosystem processes, productivity and services within the context of the existing disturbance (e.g., wetland restoration, greenway preservation, channel rehabilitation). scholarly or scientific study of a given subject, field, or problem; a close examination of a matter in search for information or truth; close careful study. are combinations of conservation practices and resource management activities for the treatment of all the natural resource concerns for soil, water, air, plants, and animals that meet or exceed the quality criteria for resource sustainability. RMSs generally go beyond management measures in that they may contain practices that address soil, air, plant, animal, and human natural resource concerns in addition to water quality. a term used by Ohio EPA when assessing the status of water quality. Response indicators are generally composite, quantitative measures of the cumulative effects of stress and exposure, and include the more direct (or natural indicator) measures of community and population response. 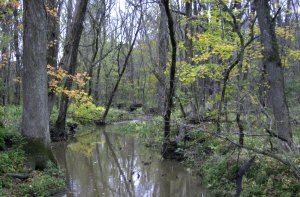 Specifically community and population response is evaluated using biological indices which comprise Ohio biological water quality standards criteria. Other response indicators could include target species assemblages, i.e., rare, threatened, endangered, special status, and declining species or bacterial levels which serve as surrogates for the recreational uses. to fundamentally change the existing condition or land use; process of working to return a habitat or ecosystem to its original state by removing the cause of degradation. Goal is to re-establish the pre-existing biotic integrity in terms of species composition and community structure (e.g. dam removal, natural channel restoration). because of the lack of a consistent definition for this term the National Research Council (NRC) provides the following. A transitional area between terrestrial and aquatic ecosystems, and adjacent to perennial, intermittent, and ephemeral streams, lakes, and estuarine-marine shorelines, that is distinguished by gradients in biophysical conditions, ecological processes, and biota, through which surface and subsurface hydrology connect waterbodies with their adjacent uplands. The riparian zone includes those portions of terrestrial ecosystems that significantly influence exchanges of energy and matter with aquatic ecosystems (i.e., a zone of influence). a method of investigation involving observation and theory to test scientific hypotheses; the process by which scientists, collectively and over time, endeavor to construct an accurate (that is, reliable, consistent and non-arbitrary) representation of the world. the stream channel form has the ability to maintain its character (dimension, pattern and profile), and repair itself over time without man-made interventions; the stream channel must be vertically stable, maintaining the same bed elevation, but may adjust laterally by eroding outside banks and depositing inside bends. the force per unit area that is parallel to a surface. In the case of stream morphology, this is the force of the stream flow on the bed and banks of the channel. occurs when people share diverse perspectives and experiences to develop a common framework for understanding and basis for joint action (Schusler, Decker, and Pfeffer 2003). articulate either interim targets or what is necessary to fully achieve water quality use attainment or eliminate threats to full attainment. TMDL reports identify targets and/or performance indicators (e.g. = QHEI scores) to achieve use attainment. In the absence of a TMDL Report, solution statements will be the best possible interim targets or local estimates of what is necessary to achieve water quality attainment or eliminate threats to full attainment. are individuals or organizations with an interest and/or ability to take action on a watershed issue. a watershed action plan that meets all criteria of Ohio's Guide to Developing Local Watershed Action Plans in Ohio including the Appendix 8 Update, the most recent U.S. EPA Section 319 Planning Guidance, and this conclusion has been stated in writing by the chiefs of the Ohio EPA Division of Surface Water and the ODNR Division of Soil & Water. sediments raise the stream bed elevation or fill the stream channel up. generally refers to the pattern of stream bed features such as pools, riffles, runs or glides, but may also include features such as point bars or other channel bars composed of deposited material. are the surface and subsurface materials that compose the stream bottom, banks, or other channel features, whether bedrock, boulders, cobble, gravel, sand, or finer-grained materials. the area of the stream corridor occupied or expected to be occupied by stream meanders. the size and shape of the stream, typically described by longitudinal slope profile, cross sectional dimension and meander pattern (see also self-sustaining stream channel and vertical channel stability. refers to measurements of channel shape conducted perpendicular to the flow of the stream. The photo at right shows the cross section of a ditch being measured. downcutting of the stream bed. streams are characterized by low stream quality and long-term instability due to separation from a functional floodplain. describes the series of morphological adjustments or changes that occur as the stream attempts to self stabilize. The series of changes may be in response to changes in magnitude of major inputs such as water, sediment, discharge, or other driving factors. characterization of stream curvature along its length. The photo at left shows a meandering channel within relatively straight ditch banks. See also stream sinuosity. ratio of stream length to valley length. a term used by Ohio EPA when assessing the status of water quality. Stressor indicators generally include activities which have the potential to degrade the aquatic environment such as pollutant discharges (permitted and unpermitted), land use effects, and habitat modifications. With the exception of permitted pollutant discharges, the stressor indicator information reported by Ohio EPA is qualitative, not quantitative. are surface waters that possess exceptional ecological values based upon a combination of the presence of threatened or endangered species and a high level of biological integrity. The following factors shall be considered in determining exceptional ecological value: providing habitat for Ohio or federal endangered species; providing habitat for Ohio threatened species; harboring stable populations of a declining fish species that coincide with the presence of suitable habitat for that species, or that coincide with an essential migration path between areas of suitable habitat for that species; and displaying a level of biological integrity equivalent to the exceptional warmwater habitat index of biotic integrity and/or invertebrate community index criteria values listed in rule 3745-1-07 of the Administrative Code. within the applicable critical areas identified, those locations where existing data documents that preservation, restoration and/or BMP implementation/source reductions will have the most impact to correct existing water quality impairment or threats to full attainment. Target implementation area boundaries will vary based on the specific type of water quality use impairment/threat, causes of impairment/threat, and particularly the locations where sources or threats are concentrated. the second most common type of reservoir in Ohio, located primarily in northwestern Ohio. The name upground is derived from their above-ground construction. Upground reservoirs vary in size, but they are typically infertile, receive and discharge water via pumping facilities, and have littoral zones comprised almost entirely of riprap. The development intensity of a riverfront corridor can be classified according to the degree or percentage of impervious cover-hard surfaces such as buildings, streets, parking lots, and sidewalks-found within the corridor. suburban (10 to 39 percent impervious cover) (Schueler 2003). the stream channel form maintains the bed elevation by neither degrading (down-cutting) nor aggrading (filling up). Note: geologic profile adjustments and long term storage of sediment fines in floodplains do not constitute channel instability. one of 331, 11-digit Hydrologic Unit Code (HUC-11) watersheds. establishing a permanent local water resource restoration or protection program.